“The First Presidency and the Council of the Twelve Apostles, called and ordained to hold the keys of the priesthood, have the authority and responsibility to govern the Church, to administer its ordinances, to expound its doctrine, and to establish and maintain its practices. Each man who is ordained an Apostle and sustained a member of the Council of the Twelve is sustained as a prophet, seer, and revelator. 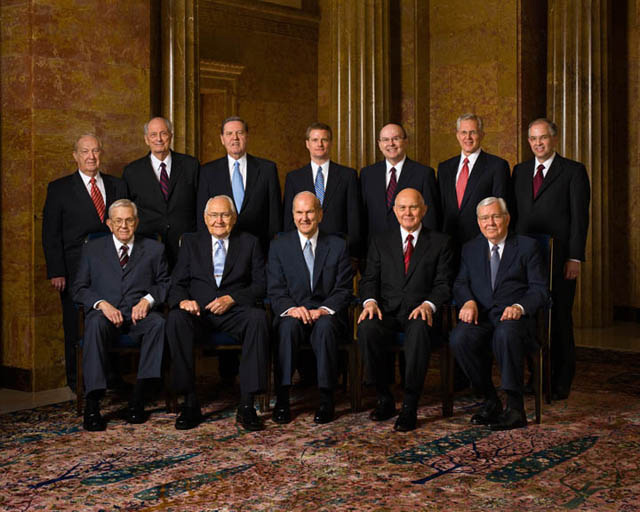 . . All incumbent members of the Quorum of the First Presidency and of he Council of the Twelve have been the recipients of the keys, rights, and authority pertaining to the holy apostleship. . . And now I quote again from the word of the Lord: ‘And every decision made by either of these quorums must be by the unanimous voice of the same; that is, every member in each quorum must be agreed to its decisions, in order to make their decisions of the same power or validity one with the other’ (D&C 107:27). No decision emanates from the deliberations of the First Presidency and the Twelve without total unanimity among all concerned. At the outset in the considering matters, there may be differences of opinion. These are to be expected. These men come from different backgrounds. They are men who think for themselves. But before a final decision is reached, there comes a unanimity of mind and voice. This is to be expected if the revealed word of the Lord is followed. Again I quote from the revelations: ‘The decisions of these quorums, or either of them, are to be made in all righteousness, in holiness, and lowliness of heart, meekness and long suffering, and in faith, and virtue, and knowledge, temperance, patience, godliness, brotherly kindness and charity; because the promise is, if these things abound in them they shall not be unfruitful in the knowledge of the Lord’ (D&C 107:30-31). I add by way of personal testimony that during the twenty years I served as a member of the Council of the Twelve and during the nearly thirteen years that I have served in the First Presidency, there has never been a major action taken where this procedure was not observed.. . Out of this very process of men and speaking their minds has come a sifting and winnowing of ideas and concepts. But I have never observed serious discord or personal enmity among my Brethren. I have, rather, observed a beautiful and remarkable think–the coming together, under the directing influence of the Holy Spirit and under the power of revelation, of divergent views until there is total harmony and full agreement. . I know no other governing body of any kind of which this might be said. . .